A billboard in Pearl is causing a lot of controversy, both because of its subject matter and because of official’s reaction to it. 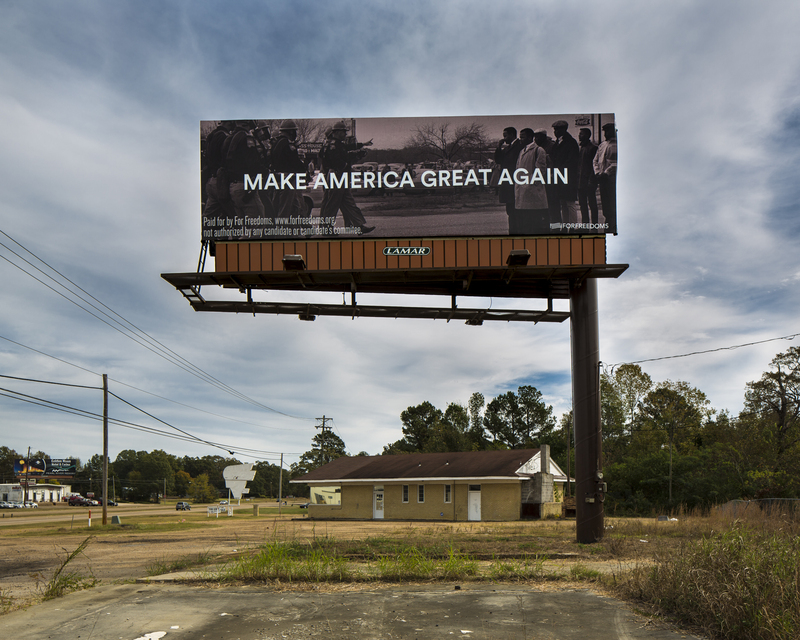 The billboard depicts a 1965 image of the protest on the Selma Bridge with President-Elect Donald Trump’s slogan “Make America Great Again” superimposed over the image. However, this billboard only stood for a few because Pearl Mayor Brad Rogers contacted Lamar Advertising and obtained from them a promise to remove it sometime this week. WJTV is now reporting that the billboard is still up, but has been covered with a black cloth. Mayor Rodgers has not spoken to any news agencies about this, so we do not know if his office was behind it, or if it was an outside group or individual. Mayor Rodgers has admitted that this billboard is protected by the First Amendment (which includes the right to free speech), but apparently still felt it necessary to have the billboard removed. The billboard was paid for and designed by For Freedoms, and art group who, according to their website, attempts to use publicly displayed art to “subvert a ‘Rockwellian’ nostalgia for a ‘simpler’ America while co-opting a visual language that is accessible to a wide audience of viewers.” This group is not affiliated with any candidate or party. The organization’s co-founder and one of the artists behind this piece, Hank Willis Thomas, told WCMH News, “I really want us to start to ask harder questions like, ‘Well, what do you mean when you say make America great again?’ That has not yet been asked.” It seems that this group is simply trying to start a conversation and confront Americans with the realities of what has happened in this country’s past, and I see do not see that – or by extension the billboard or For Freedoms – as being worth undermining freedom of speech. Although Mayor Rodgers did not force either For Freedoms or Lamar Advertising to take the billboard down, he did make it happened. He used his influence as an elected official and powerful man, at least in Pearl, to silence an art group because he found their message too controversial. This is not what America is about. We are guaranteed free speech by the constitution and Mayor Rodgers’ actions undermine that guarantee. Yes, we will sometimes not agree with art, or it will make us uncomfortable, but that is one of the basic purposes of art: to critique society and demand social change. If we allow our governments — including the government of Pearl, Mississippi — to censor art, even in the backdoor way Mayor Rodgers did, we are saying we would rather be comfortable than confront the real and pressing issues in our society.